What is a SharePoint Task List? A SharePoint Task List displays a collection of tasks that are part of a project. What does the "Open from SharePoint Task List" functionality do? The "Open from SharePoint Task List" functionality allows you to add tasks, assign resources to tasks, update the progress on tasks, and view the task information on bars that are displayed along a timeline in your SharePoint task list. If I modify my Task List and press save will it be updated? A Task List can be saved when it is opened and updated just by pressing the "Save" button. Both the Task List and its associated .MPP file in the "Site Assets" directory will be updated. How do I open a Task List from SharePoint? 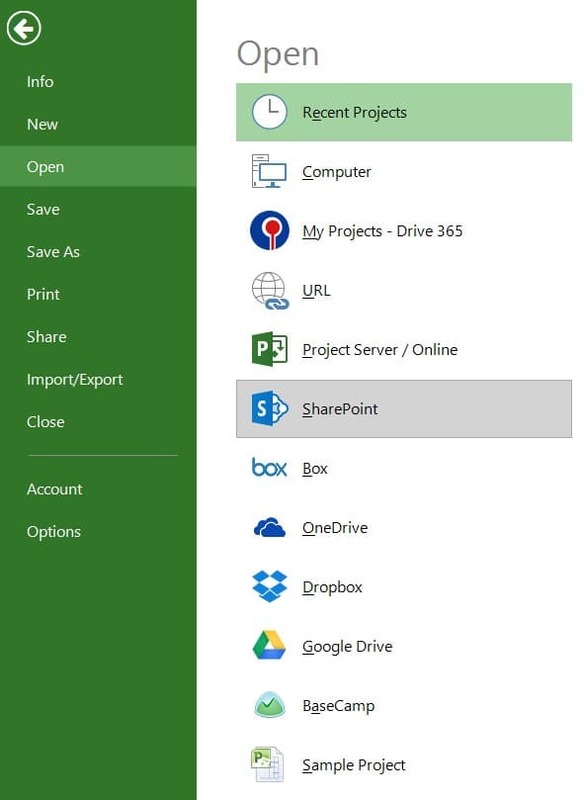 To open a Task List from SharePoint, go to File menu - Open - SharePoint - SharePoint Task List. Enter the URL address of the SharePoint Task List in the dialog box. The URL for the Task List can be taken from the browser when accessing the SharePoint Task List. How do I save a project to SharePoint Task List? To save a project to SharePoint Task List click, File - Save As - SharePoint - SharePoint Task List. When you select SharePoint Task List you will be asked first to authenticate into your SharePoint site which is stored by the application. If the Office 365 authentication is successful, a dialog will appear asking to enter a name for the new SharePoint Task List. 1. 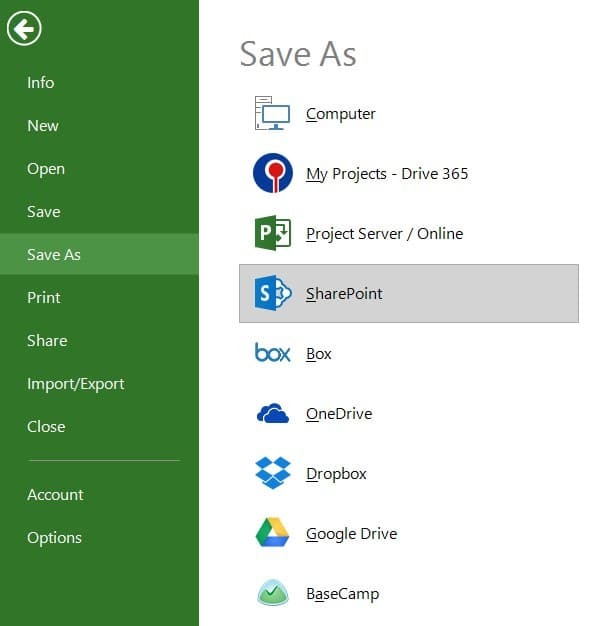 Click File menu - Open - SharePoint. 2. Choose SharePoint Task List. 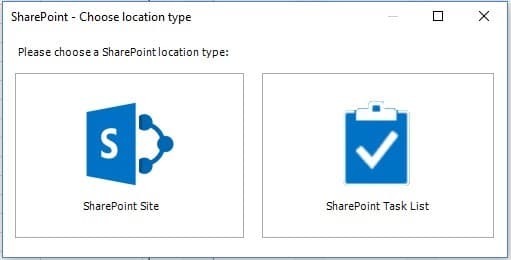 If the “Keep me signed in” option is not checked in Office365, the user will be prompted to enter his credentials in order to log into the SharePoint site (inferred automatically from the SharePoint Task List URL entered at the previous step). 1. Click File – Save As. 2. Choose SharePoint, then select SharePoint Task List. 3. Enter the URL address of the SharePoint site. 4. Authenticate into your SharePoint site. If the Office 365 authentication is successful, a dialog will finally prompt the user to enter a name for the new SharePoint Task List. As specified, the name has to be unique among the site’s task lists and it should not contain blank spaces. 5. If everything goes OK, the Task List will be created, along with the associated project file. When a Task List is open and updated in Project Plan 365, it can be saved (overwritten) just like any other file, by pressing the “Save” button. Both the Task List and the associated .MPP file in the “Site Assets” directory will be updated.